Max loves cake! 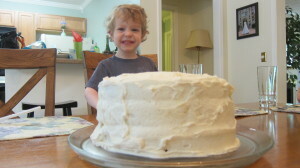 He wanted to dip his finger in the Browned Butter Frosting but I held him off until I took pictues. As soon as I read through the recipe, I knew I had to make this cake very soon. It seemed like the perfect occasion to do so when we were in Atlanta visiting family this past week. My cousin offered me a treasured Hummingbird Cake recipe that had been handed down and then passed to her by a friend and I realized that the basic Hummingbird Cake recipe from Southern Living was exactly the same. Out of curiosity I looked up more recipes and found them all to be the same. But Southern Living kicked it up several notches by adding layers of a decadent Cream Cheese Custard and then topping it all of with a Browned Butter Frosting. Anything with Cream Cheese is usually amazing and anything with Browned Butter added to the mix is definitely calling my name! I did not change any of the recipes so I am just linking to them below. The next time I make this I want to roast the bananas and make the 4 layers as suggested in order to get as much custard as possible in every bite. Also, I think it would make the cake assembly and serving easier if you took some extra time to refrigerate the layers with the custard before you attempted the frosting and then refrigerate the cake for longer than the suggested hour before serving. My final tip, and maybe the most important, is that you should read through the recipe entirely before you plan your cake baking day. In this case, the custard needs to be made and refrigerated 6 to 24 hours before you bake the cake! This cake is right at the top of my favorites so far this year. It reminded me of banana bread and carrot cake but was distinctly it’s own cake. Ridiculously delicious! Ridiculously delicious is right!!! It was decadent!! !